I am going to be honest. I was extremely skeptical about one pot pasta. 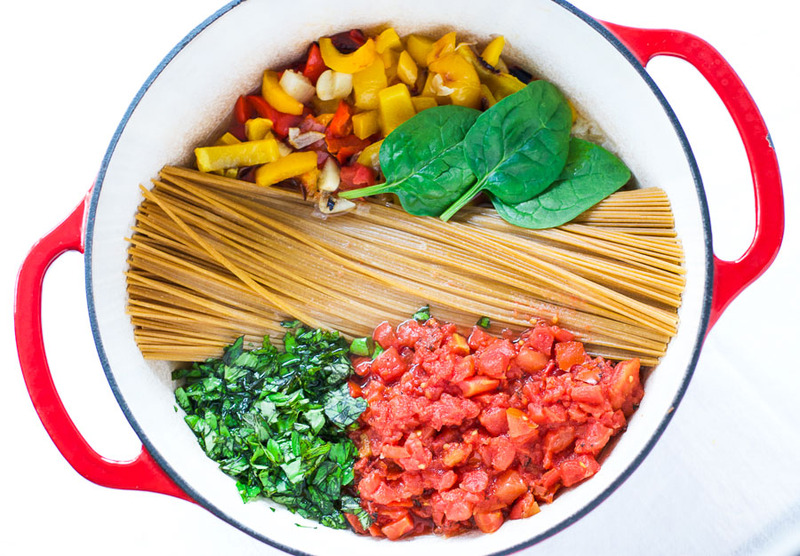 I could appreciate the beautiful before photos of raw pasta, tomatoes, and other deliciously fresh ingredients all sitting in one pot. But I was not convinced that cooking them together was going to produce anything but a tasteless, watery, overcooked mess. How very wrong I was. 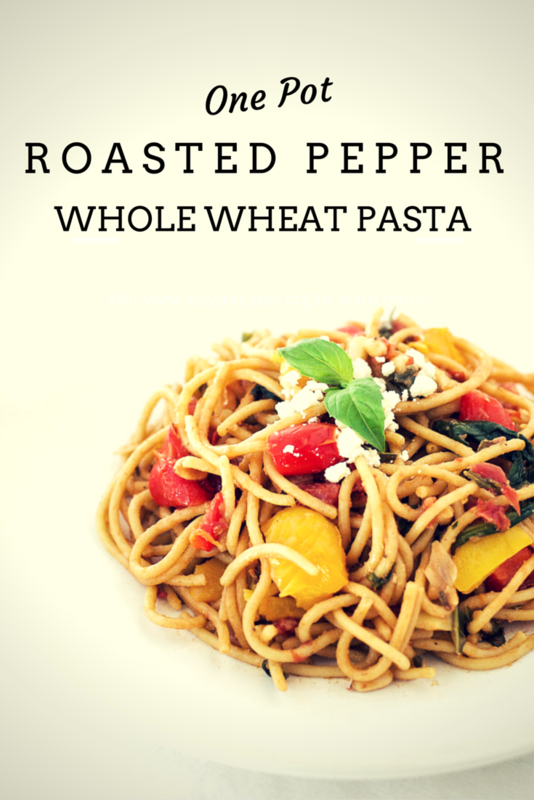 This one pot roasted pepper whole wheat pasta dish was bursting with flavor and perfectly al dente. I will admit that the roasting of the peppers and garlic made this slightly more time consuming than some recipes for one pot pasta. 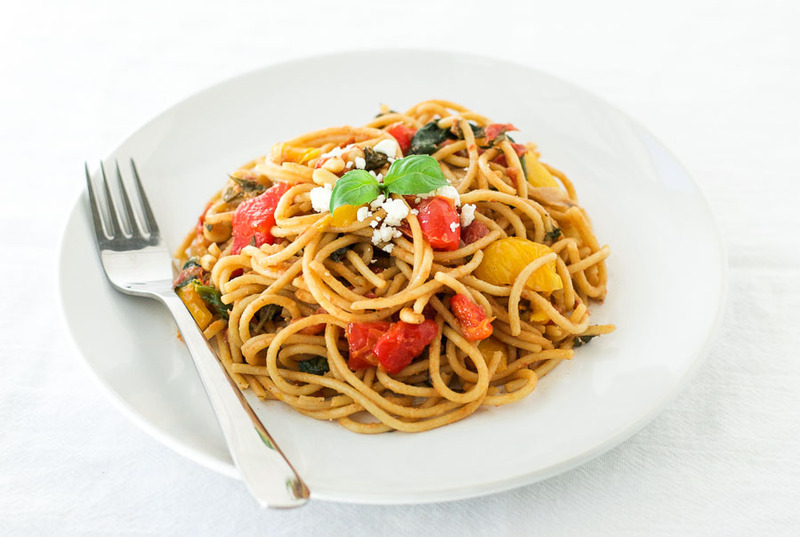 If you are short on time, you could substitute a jar of roasted red peppers and diced raw garlic. It will still taste really delicious. You can also switch the spaghetti to the pasta of your choice. However, you might need to adjust the amount of broth or the cooking time if you do. Start with a smaller amount of broth and keep checking as it cooks. If the pasta sticks, add a little more. You should end up with a small amount of thick sauce that coats the pasta. And if you skip the feta cheese garnish, this dish is vegan. Cut the bell peppers in half, remove the stems and seeds, and place cut side up on a baking tray. Place 1 clove of garlic in each bell pepper half, drizzle with 1 tbsp olive oil, and place in the oven for 25 minutes*. Once the bell peppers and garlic are cooked, roughly chop them. Heat the remaining tbsp of olive oil over a medium heat in a dutch oven or large, wide-based pan. Add the shallots and cook gently for 3 minutes. Add the chopped bell peppers, garlic, pasta, tomatoes, 2½ cups of the broth, balsamic vinegar, salt, and red pepper flakes to the pan. Make sure the pasta is as submerged as possible. Bring to the boil, then turn down to a simmer and cover. Cook for about 10 minutes, checking regularly that the pasta is not sticking to the bottom. If the water runs dry or the pasta sticks before it is cooked, add the remaining ½ cup of broth. Once the pasta is al dente, stir in the basil and spinach and cook for another minute until the spinach has wilted. Add freshly ground black pepper to taste, and serve with a sprinkling of feta cheese and pine nuts. *If you want to save time, you can use a jar of roasted bell peppers and some raw diced garlic. Thanks Dawn. I’d love to know how it works out if you try it. Looks great Esther! I was in a recipe rut and am going to try this weekend. Perfect for a college kid on a budget. Thanks Nicki. I hope you enjoy it. This looks great, I need to try! Anytime there is one less dish to wash I am all for it! That is one serious recipe Esther! I’m going to try it this weekend!